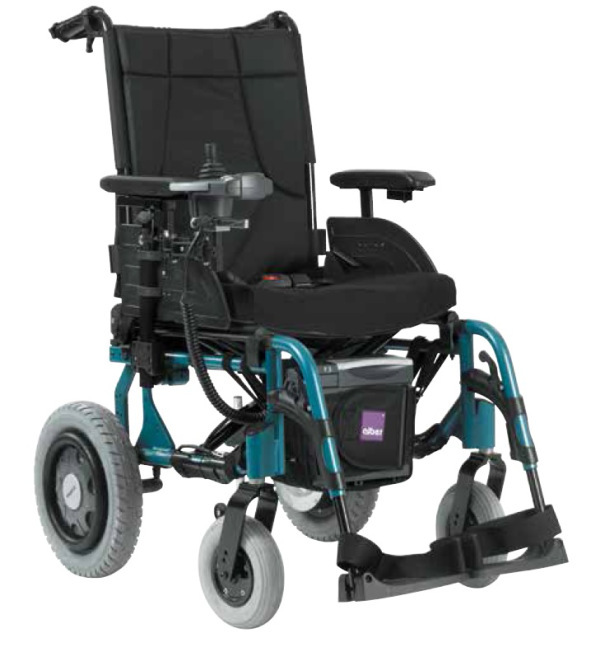 Esprit Action 4NG Powerchair Compact and Lightweight. The Esprit Action4NG provides all the advantages of driving a power wheelchair indoor and outdoor, without the size and bulk of an average power wheelchair. Thanks to the new chassis structure (available in 5 colours) and overall width, everything is smaller and narrower for getting around indoors. And with a specially designed frame the total width of the chair does not add more than 170mm (6¾") to the width of the seating. The Esprit Action 4NG is easy to dismantle making it highly transportable. The armrest width allows for configuration adjustments of up to 50mm (2”) (maximum) allowing for more customised seating and frame positions. It can be equipped with a variety of configured options including backrest for Matrix positioning. Esprit Action 4NG also provides the option of an attendant control should this be required. There is a range of colours to choose from including Ocean Blue, Slate Grey, Pearl White, and Anthracite Black for the adult version. For the junior version there is Ocean Blue, Pearl White, Bubble Gum Pink and Anthracite Black. Dual Intuitive Pressure Sensors allow an attendant to drive the wheelchair from behind in an easy yet intuitive manner. Supplied as standard with Alber Anti tippers with Jack up function to help the quick release of wheels. Welded castor mounts provide greater rigidity on the front of the chair. Adaptable arm widths gives up to 50mm (2") adjustment. Simply push and turn to removewheel. Converts to a manual self propelling wheelchair. Disassembles in to 6 component pieces. The heaviest part weighs only 15kg (33lb) (chassis). Choice of Adult or Junior Size.